Former U.S. Marine ‘Pacing Parson’ is determined to fight pulmonary hypertension with funding and awareness as he completes a 1,000-mile walk. PH is high blood pressure in the arteries of the lungs — a debilitating, incurable disease that affects the functioning of the heart and can lead to death from right heart failure. We are grateful that the Pacing Parson is so caring and passionate that he is taking such measures to bring more attention and funding to help us fight PH. 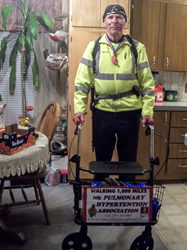 Don Stevenson, aka the Pacing Parson, is celebrating his 80th birthday by completing a 1,000-mile benefit and awareness walk for the Pulmonary Hypertension Association (PHA). He has covered 500 miles so far, but despite his determination, he’s only received $50 in his fundraising fight against pulmonary hypertension (PH). PHA now asks the public to show their support for his dedication. A daily distance walker in excellent health, the retired pastor from Auburn, Wash., is walking at least 20 miles a day across western Washington State with a walker and an oxygen tank to demonstrate the plight of many PH patients. Stevenson started the walk Jan. 4, his 80th birthday. Just two weeks later on Jan. 12, his friend, Dorothy Fitch, to whom he dedicated the walk, lost her life to PH. PH is high blood pressure in the arteries of the lungs — a debilitating, incurable disease that affects the functioning of the heart and can lead to death from right heart failure. Without treatment, the average survival time is 2.8 years after diagnosis. With symptoms that include shortness of breath, fatigue and fainting, PH is often misdiagnosed as asthma or other less-threatening illnesses. For 12 consecutive years, PHA has received the highest rating — four stars — for fiscal accountability and transparency from Charity Navigator, placing it in the top 1 percent of all rated charities. A former U.S. Marine, Stevenson earned his “Pacing Parson” moniker for completing many charity walks over the years. In September 2015, after nearly four months, he finished a 3,000-mile, cross-country walk from Washington State to the Washington, D.C., area, raising nearly $10,000 in donations and pledges for PHA. He walks six days a week, taking Sundays off to rest, and expects to complete his birthday charity walk in mid-March. Stevenson is part of the national PHA Team O2 breathe, made up of individuals across the country who challenge themselves with endurance events to fundraise for the nonprofit. PHA asks donors to help Stevenson raise funds by going to http://www.O2breathe.org/FightPH16 and clicking on the name Don Stevenson. Headquartered in Silver Spring, Md., with a growing list of chapters across the country, the Pulmonary Hypertension Association (PHA) is the country’s leading pulmonary hypertension organization. Its mission is to extend and improve the lives of those affected by PH; its vision is a world without PH, empowered by hope. PHA achieves this by connecting and working together with the entire PH community of patients, families and medical professionals. Among its programs, PHA facilitates more than 245 support groups around the country and delivers continuing education for medical professionals through PHA Online University. For 12 consecutive years, PHA has received the highest rating — four stars — for fiscal accountability and transparency from Charity Navigator, placing it in the top half of 1 percent of all rated charities. For more information, please go to http://www.PHAssociation.org, @PHAssociation on Twitter or http://www.facebook.com/PulmonaryHypertensionAssociation.